Kate Bennet owns a small bookstore in Cambria, California—the kind of shop that smells like mildew, furniture wax, and old pages, the kind where you’ll find a cat napping atop the used biographies. Two years out from a divorce that left her emotionally fragile, Kate is starting to think that maybe she’s ready for love again—or at least for a fling with a hot man. Jackson Graham is a local chef who’s controlling when it comes to food, careless when it comes to women, and temperamental when it comes to just about everything. When Kate’s friends mobilize to set things up between Kate and Jackson, she expects some casual pleasure followed by a hasty goodbye, but Jackson’s long-term crush on Kate means that he’s in this one to win. The problem is, neither he nor Kate knows whether he can change the self-defeating habits that usually send women scurrying for the door as soon as the afterglow fades. 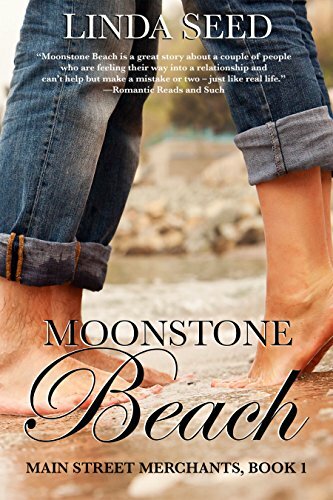 Throw in a beautiful backdrop of rocky beaches and rugged coastline, a manipulative father, a Mary Kay–pushing stepmother, a yapping Pomeranian, and a nervous ring-tailed lemur, and you’ve got Moonstone Beach, the first contemporary romance in a series of four about Kate and her friends, Gen, Lacy, and Rose.